"I would believe only in a god who could dance," wrote German philosopher Friedrich Nietzsche. During his times, God was generally portrayed as a frozen perfection—remote, static, and wholly unsociable. No wonder Nietzsche was disillusioned. He might have been pleasantly surprised to hear about Krishna, the God who dances with spellbinding expertise on the hoods of the venomous serpent Kaliya; the God who dances to the tune of His mother just to get butter; the God who dances with the gopis during the rasa-lila, a celebration of divine love; the God known as Vrindavana-natabara, the best dancer in the pastoral paradise of Vrindavana. Krishna is a mesmerizing blend of greatness and sweetness. All theistic traditions assert that God is great. Krishna graphically demonstrates that greatness. In the eleventh chapter of the Bhagavad-gita Krishna gives Arjuna a glimpse of His awe-inspiring greatness by displaying His universal form, one of the greatest mystical visions in world literature. Arjuna saw within the universal form—within Krishna—everything and everyone in existence. He saw all the planets, stars, and universes as well as all living beings, whether celestial, terrestrial, or subterranean. 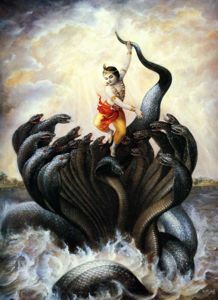 When Krishna was on earth He also exhibited His omnipotence by effortlessly conquering numerous powerful demons who were the scourges of the universe. Most endearingly, Krishna delights, not in the magnificence of godhood, but in the sweetness of uninhibited love. This brings us to a concept unique to Vedic theology, that of lila, or transcendental pastimes, as well as to a related concept: maya. "Maya is one of the most beautiful concepts in the history of religion." This remark by Indologist Daniel H. H. Ingalls is intriguing because Maya is generally considered the illusory energy that tempts and misleads us into forms of enjoyment that end in suffering. How could Maya be considered beautiful? The answer involves unraveling the mystery of the dual aspects of Maya—Yoga-maya and Maha-maya. The word maya means "energy," but it can also mean "that which is not" (ma, "not"; ya, "this"). Maha-maya, the Lord's illusory energy, makes "that which is not" seem real. She deludes those who want to enjoy independent of God into forgetting their true identity as souls, as eternal servitors of God. She allures them with various proposals for material enjoyment until they become fed up and finally turn back to God and His loving service. And for those who want to love God purely, there is another kind of illusion, a divine illusion that enhances their loving exchanges with God. The word yoga means "to connect" or "to unite," so Yoga-maya refers to the energy of God that makes possible our loving union with God. God is often imagined as a judge who rewards the pious and penalizes the impious. If that's all God had to do eternally, His life would be quite boring. But devotional scriptures like Srimad-Bhagavatam explain that being a judge is only a tiny part of God's multifaceted, nay omni-faceted, personality. Krishna has His own life of eternal love with His devotees in His kingdom. There He delights, not in exhibiting His godhood, but in reciprocating His devotees' love. In Krishna's pastoral paradise, Vrindavana, Yoga-maya covers the devotees so that they are no longer conscious that Krishna is God; they see Him only as the most special, sweet member of their village. And He plays that role to perfection. For example, with those devotees who love Him in vatsalya-rasa (parental affection), He becomes an endearing naughty child who steals butter from their houses. The women complain to Krishna's mother, Yashoda, Krishna artfully feigns innocence, and Yashoda is mystified until telltale butter on Krishna's lips incriminates Him. So celebrated are Krishna's Vrindavana lilas that hundreds of sweet songs have been composed about them and millions of Krishna devotees delight in singing them. Indeed the great Vaishnava poet Bilvamangala Thakura glorifies Lord Krishna as the ultimate thief: "My dear Lord, O best of thieves, You who are celebrated as a butter thief in the glorious land of Vrindavana, please steal away all my sins that have accumulated over many lifetimes. Skeptics who ask why God steals miss the essence of lila: love. Besides, being God, Krishna owns everything, so there's no question of His stealing anything. Yet Krishna "steals" to have fun-filled loving exchanges with His devotees. Though like a drama, Krishna's lila is real. It is the highest reality, the reality of the intimate love between the Lord and His devotees. In the eternally real drama of krishna-lila, Yoga-maya is the director and Krishna is the hero. But the special twist is that Krishna is also the scriptwriter and Yoga-maya directs Krishna according to His own script. Thus in His lila Krishna is simultaneously in control, as the scriptwriter, and not in control, as the perfect actor who forgets Himself while playing His role. This is Krishna's extraordinary world. Krishna-lila reveals the import of the saying "God is love." For most people, and especially for the demoniac, Krishna's greatness hides His sweetness. Krishna went as a peace messenger with sweet words to dissuade Duryodhana from the Mahabharata war. But when the arrogant prince tried to arrest Krishna, He foiled the attempt by revealing His gigantic universal form. For the purest devotees, Krishna's greatness gives way to His sweetness. During the rasa-lila, Krishna disappeared and then reappeared before the gopis in His majestic four-armed Vishnu form. When Radha, Krishna's most beloved consort, bowed before Vishnu and asked Him where Krishna had gone, Krishna as Vishnu tried to artfully point in a false direction. But seeing Radha's selfless love and Her intense anxiety caused by separation, Krishna could no longer keep up His guise. His two extra hands disappeared, and Radha beheld before Her the sweet Lord of Her heart. As Krishna's sweetness surpasses His greatness, so too does His love supersede His laws. The laws of karma impartially and unerringly deliver everyone their karmic dues sooner or later. But if we turn to Krishna with devotional love, He displays His sweetness as a forgiving father. His unequivocal promise in a concluding verse of the Gita (18.66) shows that His mercy transcends His justice: "Abandon all varieties of religion and just surrender unto me. I shall deliver you from all sinful reactions. Do not fear." We can easily surrender to Krishna by chanting His holy names, which reveal both His greatness and His sweetness. The holy name has a great power that even nuclear weapons don't have—the power to destroy all our negative habits and tendencies. And the holy name is so irresistibly sweet that saints desire thousands of mouths to relish its taste. Not only that, the holy name softens our heart and redirects our love to Krishna. When our heart becomes soft with love for Krishna, soft like butter, then makhana-cora (butter-thief) Krishna will come and steal it. Devotees pray and long for that ultimate love-theft. Krishna and His devotees express divine love not only through humanly inconceivable ways such as thievery, but also through humanlike ways such as dancing. Spiritual savants consider the celebrated rasa dance the culmination of divine love. Although this dance appears similar to an ordinary dance involving boys and girls, we can understand its supra-mundane nature when we hear about it from faithful, learned devotees like Srila Prabhupada, who has explained it in his book Krishna: The Supreme Personality of Godhead. Indeed the rasa dance is so spiritually exalted that those advanced devotees who have absolutely no interest in mundane pleasures—like the celebrated six Gosvamis of Vrindavana—cherish and worship it in the innermost core of their hearts. While we aspiring devotees can't yet take part in the rasa dance, we can relish divine dance in the form of sankirtana, the congregational chanting of the holy names of Krishna. The exuberant singing and dancing of sankirtana are a profound and potent form of meditation. The purpose of meditation is to experience spiritual reality. Silent meditation tries to achieve this by negating the material, by deactivating the body and the mind. But since we're habituated to physical and mental activity, wouldn't it be easier and more natural if somehow the body and the mind could be used to raise ourselves to spiritual levels of consciousness? That is precisely what sankirtana does. Engaging the body in graceful dance for the pleasure of the Lord, and the mind in prayerful contemplation on the sound of His holy names—especially the maha-mantra: Hare Krishna, Hare Krishna, Krishna Krishna, Hare Hare / Hare Rama, Hare Rama, Rama Rama, Hare Hare—quickly and efficaciously transports our consciousness to the joyful realm of divine love. Thus sankirtana acts like spiritual-music therapy to heal the soul in the current Iron Age, Kali-yuga. Just as iron burdens the person carrying it, negative thoughts and emotions burden most people in the present age. Sankirtana floods the heart with positive, precious, golden emotions like love, faith, and joy and flushes away negative, burdensome emotions like hatred, anxiety, and sorrow. Sri Chaitanya Mahaprabhu, who appeared some five hundred years ago, revived and popularized sankirtana all over India. As the incarnation of Krishna for Kali-yuga, Lord Chaitanya displayed divine dance so enchantingly that His golden complexion, graceful gait, and intense devotional emotions charmed everyone—from aristocrats like the king of Orissa down to crime-hardened lowlifes. These verses composed by a Muslim emperor in glorification of one who is commonly considered a Hindu saint illustrate the universal appeal of the divine love Sri Chaitanya Mahaprabhu personified and propagated. As a spiritual master in Chaitanya Mahaprabhu's line, Srila Prabhupada, through his ISKCON, popularized the divine dance of sankirtana in our times. Chanting and dancing devotees are now a familiar sight in major cities all over the world. Given the deep theology and intense devotion that lies at its heart, this simple-looking dancing can well be called the ultimate dance.